Gig! 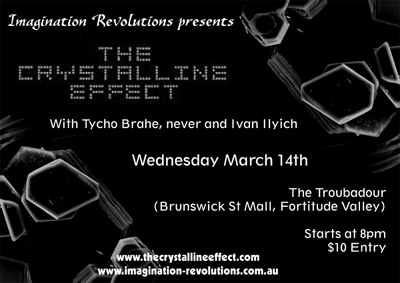 Wednesday 14th March @ The Troubadour, Brunswick Street Mall, Fortitude Valley. Tycho Brahe, Crystalline Effect, never and Ivan Ilych. Doors at 8pm, $10 entry. Presented by Imagination Revolutions.